This photo shows the pavilion in the middle of the central town square of Santa Cruz. The concrete shade structure has pre-Columbian motifs. Costa Rica does not have architectural remains of its Pre-Columbian heritage, unlike the Mayan cities to the north and Inca cities to the south. I therefore think it is a good thing to incorporate indigenous design elements in contemporary construction. 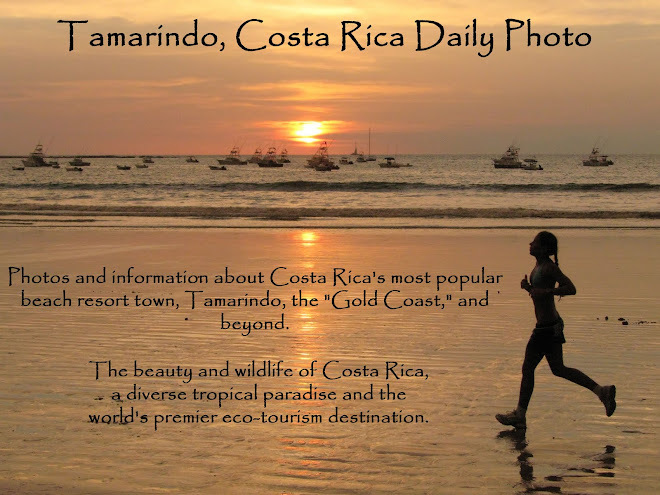 Santa Cruz is the nearest big town to Tamarindo, with a population of about 12,000. It is about a half hour away. In fact, Tamarindo does not have its own town government, and the city government in Santa Cruz is also the municipal government for Tamarindo. Today is Sunday, so we have new photos on our Viva la Voyage travel photo site. This week we are showing the interior of the Music Palace in Barcelona. If you have not been there, you are in for a treat. During a gentle late afternoon rain, the clouds dropped so low that they touched the coastal hills just 15 or 20 minutes inland from Tamarindo. The elevation of these hills is probably about only 200 meters (700 feet) above sea level. I took these photos about a month ago when I drove the back roads to Santa Cruz on my way to the Liberia Airport to pick up my wife, who flew into Costa Rica a day after me. I will show some more photos from this little road trip in the coming days. This week we are showing photos of the Villa Melzi in Bellagio, Italy, on our Viva la Voyage travel photo site. In rural Costa Rica, you will occasionally see make-shift football (American soccer) fields. This field is a pasture in which some villagers have erected a goal from sticks, and children are using it to good advantage to play football. on our Viva la Voyage travel photo site. This photo shows a typical rural house in Costa Rica. They are small by American standards, but are solidly built, painted charming colors, and almost always have a tin roof. Satellite TVs are popular. This house has a nice garden. This is a photo of the lush pastures in the area inland from Tamarindo. This photo is looking west, in the direction of the Pacific Ocean and the sun in the late afternoon. On my last visit to our condo in Tamarindo, Julie had to postpone her departure from Phoenix/Scottsdale by a day, so I drove back to the Liberia airport to pick her up. Because some people have left comments expressing an interest in more photos of everyday life, I took the back road from Tamarindo to Santa Cruz, the nearest large town, to get some photos to post of typical Costa Rican scenes. I hope you will find this new series of interest. Today is Sunday, so we have new photos on our Viva la Voyage travel photo site. This week we are showing photos of the Villa Melzi in Bellagio, Italy. This is a photo of new mangrove trees that are creeping out from the existing mangrove forest and starting to grow in the sand flats near where the Langosta estuary flows into the Pacific. In future years this area of the estuary might be covered with a thicket of mangrove trees similar to what I posted yesterday. It is beneficial for the environment that mangrove areas in Costa Rica are protected from development and are actually growing. In many places of the world, Florida in particular, mangroves have been replaced by development. Tomorrow we will leave the beach and begin a new series of photos. If yesterday's photo was not enough to convince you that it would be futile and frustrating to try to walk through a mangrove forest, perhaps today's photo will. Crabs, raccoons, and monkeys travel through mangroves. Humans? We can float in a boat, or walk on a trail, but there is no way to walk through a mangrove thicket. 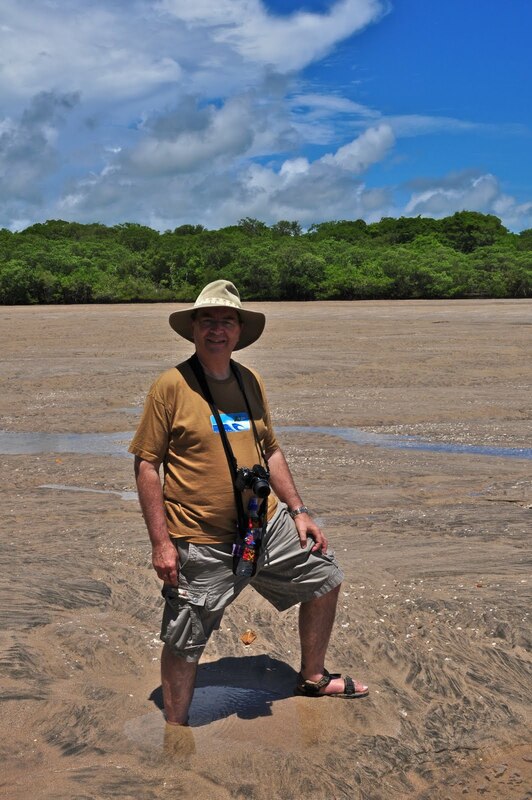 Tomorrow I will show you why it is important and beneficial that Costa Rica protects all of its mangrove areas. This is a closer view of the mangrove forest that lines the Langosta estuary. There is no way to walk through a mangrove area such as this. I mentioned yesterday that all mangrove areas in Costa Rica are protected. They are important habitat for fish and wildlife. Costa Rica is justifiably proud that about 25% of all of the land in the country is set aside for national parks and refuges -- more than any other country on earth. That percentage does not include the mangrove areas, which are located in small pockets too numerous to include in formal park areas. This is as far as we could walk up the Langosta Estuary. The trees on both sides of the estuary are mangrove trees. In Costa Rica, all mangroves are protected, even if they are not located in a national park. Building and development is not allowed in mangrove areas. There is no path along the shore of the estuary because of the density of the mangroves, as I will show you tomorrow. The Langosta estuary provides a natural barrier that separates Playa Langosta from the area inland, and makes Langosta feel like a peninsula, as there is only one road into and out of Langosta from the north, where it borders Tamarindo. There is no road across the mangrove or estuary. This week we are showing photos of the festive pedestrian street Las Ramblas of Barcelona on our Viva la Voyage travel photo site. Every once in a while, when walking in estuary sand you will sink in to above your ankles. It feels like quick sand, except you then hit a firm bottom and stop sinking. The estuary sand is very heavy because it is soaked with water and has a little sediment mixed with the sand, unlike beach sand. It takes effort to lift your foot out. Yet, only a step away the sand can be firm and support a person walking easily. My wife took this photo about two weeks ago on our last stay in Tamarindo. Photos like this motivate me to spend more time walking along the beach and less time at the dinner table, as I might not sink as much into the sand if I did so. Several days ago one of my favorite readers, Kate of Visual St. Paul daily photo blog, left a comment that she would like to be walking across the sand that I showed. I don't know if the photo of my right foot today will change her mind or confirm her interest in walking along estuary sand. Have you wondered what it is like to walk through the sand in an estuary environment? It is different than walking on the sand on the beach, such as the dunes shown in the top of this photo. Water covers this sandy area more than half of the time, as the sand is exposed only at low tide. I will show you what the walking can be like. Tomorrow. I mentioned yesterday that the shells provide habitat for crabs. This is a close view of a portion of yesterday's photo, showing a crab amidst the shells and fragments of coral. When walking in the estuary and looking at the shells, often times they move from the hermit crabs inside. The local culture is not to take shells from the beach in protected marine areas. The Langosta estuary has lots of shells. They are deposited by the tide as it recedes slowly. Some of the shells are habitat for some of the crabs, such as the one whose prints in the sand traversed the photo I showed yesterday. Sheltered from the waves of the ocean, the tide receding from the shore of the estuary leaves interesting patterns and colors in the sand. If you look closely, you will see some animal tracks across the middle of this photo. I assume that it is from a crab. It is only at low tide that we can walk up the Langosta estuary. At high tide, water would cover the area where this photo was taken. When it has just changed from high tide, you can imagine how strong the currents are, as the entire estuary flows out to the sea like a river through this narrow channel, which is quite peaceful at low tide. Today is Sunday, so we have new photos on our Viva la Voyage travel photo site. This week we are showing photos of Las Ramblas, a pedestrian street in Barcelona. This is a view up the Langosta estuary from its mouth. The ocean is to the right. The estuary snakes around to to the left. I took this photo is at low tide, when it is possible to walk along the shore until the estuary transitions from tidal sand flats into a dense mangrove forest. Come join me for a virtual walk up the estuary in the days ahead. We are showing photos of Chicago this week on our Viva la Voyage travel photo site. Playa Langosta is bordered on the south by the Langosta estuary. This photo shows the spot where the Langosta estuary flows into the sea, at low tide. The waves in the distance are the ocean surf landing on Langosta beach. On the far side of the reflection in the estuary water are the ripples of the estuary flowing into the ocean. I took this photo about a week ago, and we had glorious sunshine and majestic, puffy clouds like you see reflected here each day of our latest visit of about 10 days in our Langosta condo. In some cities it is common to see pedestrians carrying brief cases. In Tamarindo, it is very common to see pedestrians carrying surfboards. This couple was walking down the main street that runs along the beach. This scene is as close to what you could call a "downtown" in Tamarindo. This couple is approaching one of the two main intersections in town, where you see the truck turning left. The nearest traffic light is about a half hour away. This is part of the gardens on the grounds of the Tamarindo Diria Resort. Our condo building is in the background. We are on the 4th floor, so we have a view above the tree tops, but even the ground floor units have delightful views of the lush landscaping. There is one other condo building in the main part of Tamarindo that is as close to the beach as we are and that "competes" for rentals to visitors. One difference, however, is that we offer the amenities of a resort, including a pleasant walk through these landscaped grounds to the beach. The competing condo is located behind a strip mall. This close-up photo of a crab shows how well camouflaged it is. His pattern is spotted in the same shade as the sand. Even his eyeballs blend in with the surroundings. Can you spot them, protruding above his shell? This is a photo of Langosta beach at high tide. There is still enough room to walk along the trees and bushes that line the sand, although there are a few spots where you need to time your steps with the receding waves or to walk up through the trees. We love to walk along Langosta beach. It is quiet and uncrowded because this is a residential area. The first 50 meters of all beaches in Costa Rica are public property so we can walk up and down the beach without worrying that any one owning beachfront property will object or will cut off access. This is a photo of Langosta Beach right behind our Langosta condo. This is at mid tide. If it were low tide, there would be more volcanic rock and tide pools exposed where the water is in this photo. If it were high tide, well, you will just have to return to see tomorrow. Julie and I returned from Tamarindo to Scottsdale last night, and this is one of the photos we took last week. Last week was my first stay in Tamarindo since I got a new camera, so hopefully you will notice an improvement in the quality of the photos that I post in the future. Today is Sunday, so we have new photos posted on our Viva la Voyage travel photo site. This week we have posted more photos of Chicago, whichh I hope you will like. A few days ago I showed a photo of the reef of volcanic rock that is exposed at San Francisco Point at low tide. The texture, color and patterns of the surface vary in this area. This photo is a small sample of the walking surface that allows us to walk at water level around the point that divides Tamarindo Beach from Playa Langosta. At high tide, the waves crash over this point and it is necessary to take a short trail to bypass the point. The tide pools exposed at low tide along along the rocky San Francisco Point and Playa Langosta are teeming with sea life. This is a photo of a sea urchin in one of the tide pools. Tamarindo Beach never ceases to amaze and delight me regarding the gentle slope of the beach. Here you can see the patterns and color in the sand under a glaze of water and reflections. Reflections are common in lakes, but not in the water of the ocean. This is the same scene of Tamarindo beach as my post below, but from a lower perspective, closer to the water. Which do you like better? My wife and I took a tour of India about 5 years ago and we met a professional photographer from Los Angeles named Rhys. He would often get his camera down on ground level, so Julie and I refer to these type of photos as a "Rhys shot." It was on our India trip that I lost possession of my camera, as Julie "borrowed" it and learned from Rhys, taking better photos that I did. From that trip on, we are two-camera travelers. We cannot share. By coincidence, Rhys was on the same tour of Morocco that we took several years later, so Julie got to advance her photographic skills to yet another level. After yesterday's photo showing he volcanic rock, I thought I would post a photo to reassure people who are thinking of visiting Tamarindo that the beach is sandy and not rocky. This is the area right next to the scene that I posted yesterday. From the rocky San Francisco Point that I showed yesterday, there is broad crescent shaped beach that extends most of the way to Cabo Velas, the point to the north that you see across the bay. I took this photo at low tide just a few minutes after taking yesterday's photo. You can see the slope of the beach is very gentle. At high tide you could wade all the way out to the surf in this photo and still be below your waist. Note that there is even a bitof reflection of the clouds visible in the ocean. This is a photo across Tamarindo Bay to Cabo Velas, anchoring the north end of the bay. I took this from San Francisco point, where there is a volcanic reef that is exposed at low tide, with tide pools galore. This week we have urban scenes from Chicago posted on our Viva la Voyage travel photo site. This little series of beach photos would not be complete without a surfing scene. This is from the northern end of Tamarindo beach, which is popular with people learning to surf. It is also popular with swimmers who like to stay out of the way of those who are learning to surf. I have shown photos of families enjoying Langosta beach during the past two days, so here is a photo of a family on Tamarindo beach. I took this photo at low tide. Where this family is standing is usually where people would be wading out into the ocean. The parents seem to be looking out to the bay, perhaps at a pelican or pleasure boat. Their daughters seem more interested in the sand. After showing several weeks of photos of crocodiles, iguanas and other animals, it is time to return to some photos of the beach, such as yesterday's and today's photos. This young mother is watching her daughters engage in the classic and simple pleasure of playing in the sand. She is wise to put a hat on her younger child, and I hope her older child has plenty of sun screen on her back. The mother is protecting her own back and shoulders from the sun, but she might be getting too much sun elsewhere. As these photos show, Tamarindo and Langosta (where I took these photos) are nice beaches for families. During the summer months, it is particularly common to see families enjoying the beach. During the January through April "high season," it is more common to see mature couples escaping the cold weather up north. Fully half the people who rent my two condos during the high season are Canadians. Today is Sunday, so we have new photos on our Viva la Voyage travel photo site. This week we have a different type of photo series than normal, as we are featuring urban scenes from Chicago. A ritual of vacations, of course, is to take family photos standing in front of memorable places. This family is creating memories that will hopefully last a lifetime. For Father's Day two weeks ago, my younger son came over and we went through my old slides from his and his brother's childhood. They included photos like this. We need to get the slides converted to digital in time to give to my older son, as he is getting married this fall and his fiance's family want to do something with his childhood photos. It was a wonderful Father's Day. This week we are showing some more photos from our recent trip to Yosemite National Park on our Viva la Voyage travel photo site. The first of the month worldwide Daily Photo theme for July is "green." This is an easy theme for Costa Rica, as green is all around. We are blessed with lush tropical landscaping, trees, and greenery all around. I have chosen a green iguana, as it has the word green in the name of the species, and for good reason. Its distinctive green color is ideal for hiding in trees, which is where they spend most of their time. Green iguanas have several distinctive characteristics besides their green color, which you can see here: the sickle shaped scales running down the back, the large round scale below its jaw, and the dewlap hanging from its neck.